Grand Theft Auto: Vice City Stories was an exclusive game for the PlayStation Portable. Because of its success, it was later released on the PlayStation 2 console. It is the fifth Grand Theft Auto game to appear on a handheld console (the others being Grand Theft Auto 1, Grand Theft Auto 2, both on the GameBoy Color, Grand Theft Auto Advance, on the GameBoy Advance and Grand Theft Auto: Liberty City Stories, appearing on the PlayStation Portable and the sixth (and also last) game of the GTA III Era. The game has been developed by Rockstar Leeds, and published and released by Rockstar Games. Take-Two Interactive originally announced the title was to be released in North America on 17th October 2006 and in Europe on 20th October, but early in September there was an announcement stating the game had been delayed for release until 31st October in North America and 3rd November in Europe. It had also announced that the game will be released on 10 November 2006 in Australia. The suggested retail price in the United States is $49.99, and £34.99 in the UK. On February 7, 2007 Rockstar Games announced plans for a PlayStation 2 release. The release dates were March 6 2007 for North America and March 9 2007 for Europe. The game retails for £19.99 in the UK and $19.99 in the US. The PS2 port has exclusive content that the PSP version doesn't have, such as additional unique stunt jumps and rampages. 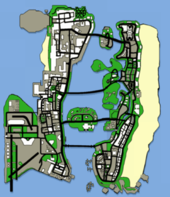 Map of Vice City in GTA Vice City Stories. Vice City Stories marks the series' return to Vice City, with the game taking place in August of 1984, roughly two years before the events of Grand Theft Auto: Vice City. The game focuses around Victor Vance, the brother of Lance Vance who betrays Tommy Vercetti in GTA Vice City. 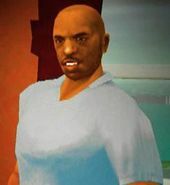 Victor briefly appears in GTA Vice City in the opening cutscene, in which he is killed during a drug deal gone wrong. In addition to the gangs previously featured in Vice City, new gangs make a debut in this game: the Trailer Park Mafia, the Cholos, the Mendez Bros. Gang, and the Stallionz. GTA Vice City Stories is structured similarly to other releases from the Grand Theft Auto series. The core gameplay consists of elements of a third-person shooter and a driving game, affording the player a large, open environment to move around in. On foot, the player's character is capable of walking, running, swimming, and jumping, as well as utilizing weapons and basic hand to hand combat. Players can steal and drive a variety of vehicles, including automobiles, boats, airplanes, helicopters, and motorcycles. The open, non-linear environment allows players to explore and choose how they wish to play the game. Although storyline missions are necessary to progress through the game and unlock certain areas and content, they are not required, as players can complete them at their own leisure. When not taking on a storyline mission, players can free-roam and create havoc (e.g. Drive-By Shooting, robberies, etc). However, doing so can attract unwanted and potentially fatal attention from the authorities. The more chaos caused, the stronger the response: police will handle minor infractions, whereas SWAT teams, the FBI, and the Vice City national guard respond to higher wanted levels. The player can also partake in a variety of optional side missions. The traditional side missions of the past games are included, such as dropping off taxi cab passengers, putting out fires, driving injured people to the hospital, and fighting crime as a vigilante. A new addition to the game is "Beach Patrol", in which Victor plays lifeguard on Vice City's beach, saving citizen's lives or dispatching local gangs. One of the key gameplay elements in Vice City Stories is "empire building". New to the GTA series, it borrows a few ideas from Vice City's "properties" and Grand Theft Auto: San Andreas' "gang wars" systems. In order to make money, the player must open and operate various businesses on property taken over from enemy gangs. For Vice City Stories, the combat system was overhauled to feature more depth than ever before. The targeting mechanic has been tweaked to "intelligently target"; enemies posing a threat or attacking the player will be targeted over pedestrians. The biggest changes concern the hand-to-hand combat system, as players can now perform grappling moves and throws, and stand on top of enemies laying on the ground. For the first time in a Grand Theft Auto game, players are able to bribe policemen or hospital staff when "Wasted" or "Busted" in order to keep weapons that ordinarily would have been lost. Also new to the series are icons scattered around the city that allow Victor to purchase vehicles. For example, a bulletproof Sanchez is available at the first safehouse. The standard hidden package system returns in the form of 99 red balloons scattered around the city. This is a reference to Nena's 1980s hit, "99 Luftballons". Also, extras that have been discovered (Red Balloons, Rampages and the Unique Stunt Jumps) appear on the in-game map. Trip skips also return. Improvements to the graphics since the release of Grand Theft Auto: Liberty City Stories include new animations, faster load times, a further draw distance, reductions in clumping of pedestrians and vehicles, more complex and realistic explosions, and increases in the density of objects, vehicles, and NPCs. 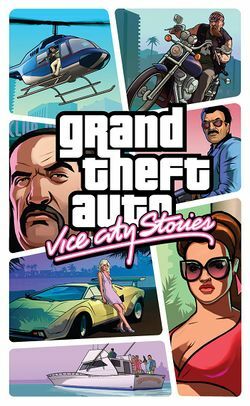 Like all other releases from the Grand Theft Auto series, Vice City Stories' soundtrack plays an integral role in setting the game's atmosphere. It features 9 different radio stations that play over 100 licensed songs from the 1980s. Most of the station remain the same as in the settings of Vice City (1986), but the radio stations Fever 105 and Wildstyle are replaced with Fresh 105 and Paradise FM, respectively. Also the talk show K-CHAT doesn't exist in 1984. The weapons in Vice City Stories are set to fit the time the game is set on. For instance, the Tec-9 is replaced with a Scorpion and the rocket launcher has the look of an M72 LAW. The M4 is switched to the look of a M16 as there were no M4's during 1984. The main pistol in the game was changed to the Beretta 92. Most of the other weapons are the same as the one's from Vice City, San Andreas and Liberty City Stories. It is unusual that GTA Vice City Stories has the AK-47 whereas GTA Vice City has the Ruger. Note that the AK-47 was designed and manufactured in 1946. The machine gun in the game was a M249, whereas in Vice City the M-60 was used. This page was last modified on 27 September 2013, at 22:13.